One in every 3,600 children born in Canada has Cystic Fibrosis (CF), and according to the averages, one person dies from the disease in Canada every week. Ninety per cent of cases will be diagnosed before the age of ten, and just over half of those diagnosed will live to the age of 40. This is a far longer life expectancy than even a decade ago, as well as a far better rate of diagnosis. The fight to continue this move forward took another step itself on the morning of May 27 at the BC Wildlife Park just east of Kamloops. They couldn’t have asked for a nicer day for a wander around the park — and many turned out to show their support in the battle against the affliction which is the most common fatal genetic disease affecting young Canadians today. 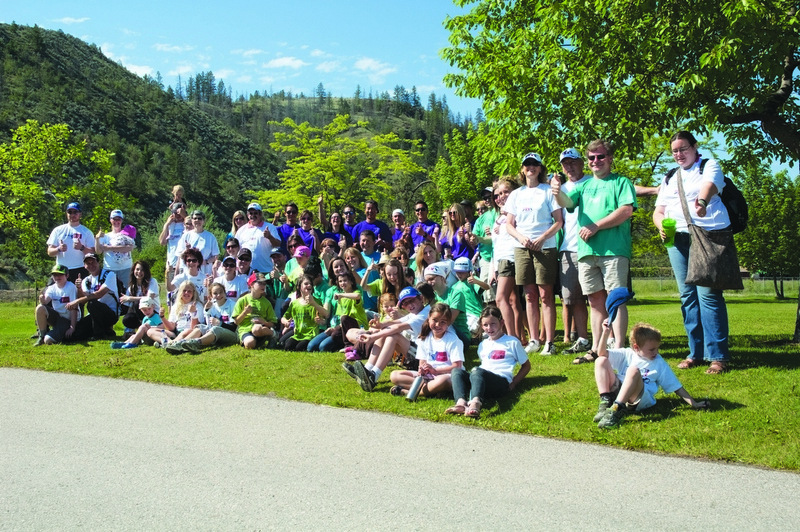 Around 50 people, including many children, came out to support the CF Kamloops organization in their annual “Great Strides Walk,” this year, raising an estimated $10,500. That’s about $3,000 more than the previous year, according to Matthew Robinson, CF Kamloops’ chapter president. “We did notice a lot of new faces this year, which is fantastic,” Robinson said. Matthew and Nicole have three daughters, two of which have CF. Alysa and Kiana (aged seven and five) have varying degrees of difficulty with the disease and as such have different regimens of treatment and therapies. “In the morning the girls have to do about an hour and a half of inhalation treatments and physiotherapy sessions before we can leave the house,” according to Robinson. Physiotherapy for Kiana consists of clapping on her sides back and chest to try and get rid of the mucus in her lungs, while Alysa does her breathing exercises, during which she suspends a “little thing” inside a tube with her exhalation for 4 seconds, 15 times. She does six repetitions of this. They repeat the therapies before bed at night, meaning they spend about three hours per day just working on their lungs. They also have to take numerous pills and medications before meals and snacks so that their bodies will metabolize their food. And then there are the hospitalizations. “Alysa is at the point in her treatment where she is being hospitalized every two months for a minimum of two weeks,” said Robinson. Kiana isn’t hospitalized nearly as often, he said, “probably only about four times in her life,” which he suspects is because of her early diagnosis. Alysa was diagnosed when she was 18 months old while Kiana was diagnosed before she was even born by a process called amniocentisis. It is a difficult life for the Robinson family — one that many might pity, and some would resent if it were their own — but they live lives full of happiness and joy, and they try to make the world more aware while they live it. “It is sometimes difficult to talk about, but if sharing our story means that more people are learning that CF is out there, we will tell it over and over again,” Robinson said. CF Kamloops is holding another fundraiser this summer, hosting a fishing derby at Kamloops Lake on Saturday, Jul. 7. They have many prizes to give away — including a fishing boat package that you can win without even catching a fish — as well as a beer garden, concession stand and various entertainers on-site at the Savona Boat Launch. The event begins at 7 a.m. and you can get involved by calling Steven at 250-314-1460 or emailing him at catchnrelease@telus.blackberry.net.